Hank, wasn’t Livy’s History of Rome also a main source for this poem? Yes, Howard, that’s right. Livy of course was several centuries earlier than Ovid. Thanks for mentioning it! Hank, the year of 1566 seems to be inaccurate. Ha! Yes, by a cool 400 years! Thanks, Sandy. 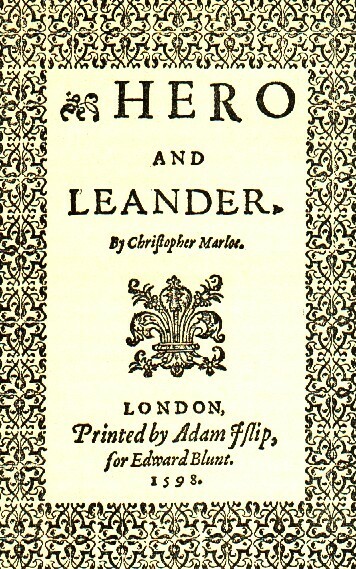 Hero and Leander is far too close to Venus and Adonis to be Marlowe’s. The style, vocabulary, sources… nothing match Marlowe. My idea, following Stephanie Hughes, is that this poem was written by Oxford probably in later years and attributed to Marlowe because he was already dead by the time (or just exiled, depend on which end you think Marlowe had). If Hank writes, there are hundreds of verbal echoes and dozens of comparable scenes and situations in the works of the two men of the same age [ with a seemless, non overlapping transition 1593 from highly popular Marlowe, superstar of the London theater to a yet unknown Shakspere] and that frequently it is difficult to guess who is echoing or borrowing from whom, then Hank consciously or unconsciously knows that this situation is out of any conceivable likelihood. I am certain that Hank in his second part (blog 96) will not arrive at the most plausible and logic, and only possible consequence that it can by no means have been the work of two men but of a single genius , who because of life threatening was forced to change 1593 identity and name masking and writing behind multiple pseudonyms (including living business man from Stratford). I am curius to read how Henk in blog 96 gets around that, declaring Edward the only possible genius and the solution of the problem? Thanks for dropping by. Well, you’ll definitely find out how, in what will be part two of Reason 95. I’m working on a brief writing project so will probably not post the second part until later in the week or right after the Memorial Day weekend. For all I know there will be three parts to the same reason. I agree with the single-genius point, by the way. Otherwise, even you might be convinced that Edward was the man … just kidding … but I do believe it’ll be a solid case. I look forward to hearing from you afterward. independently of Hank, my humble advice is that don’t put much energy into the Marlowe-version. The real author was Oxenford, either they are the same person or not. The real proof will come, stay tuned. 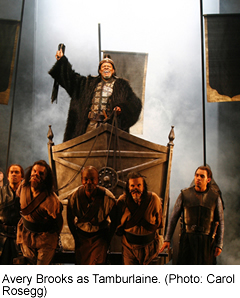 Whittemore, the idea of the author of Shakespeare being Marlowe is convinced, but watch out! there are differences between Marlowe and Shakespeare which makes the claim of the single-author somehow impossible. If the matter was Marlowe, I would put attention on his translation of “Amores” and “Hero and Leander”. This poem, alongside with “Edward II” as nothing to do with Marlowe, as far as my researchs have concluded. For example, the sources and the styles are quite differents. Also, the evidences to identify Oxford with Greene make Oxford busy at the begining of the 1590’s with ending his pen-name and start a new (thus Shakespeare in “Venus and Adonis”). I would bet on Stephanie Hughes’ thesis that Marlowe was a pupil to Oxford and Walsingham. Why of this two? Because Walsingham was thinking on preparing the public to a war with Spain and with Oxford went out to find young writers with good expectations to because persuasive writers to the propaganda. Something used, for example, in many movies during the II World War to make people choose sides and fight. I believe John Donne was also made a “pupil” of Oxford with this scheme, I’m with Mena by identifying Donne with Nashe. Hughes claim Marlowe absorved much of Oxford (this would justify the similarities of styles and phrases, but no an 100% match, failing in, for example, sources, Marlowe being less Ovidian like Oxford as Greene and Shakespeare). He, helped by his ambitions and Edward Alleyn, “rebeled” against Oxford and Walsingham. 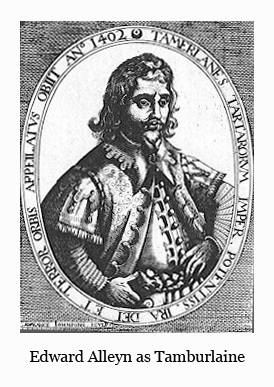 Henry Chatell, the most likely author of “Groatsworth”, must have knew this, and advised him before he was killed (or exiled, his death is polemic, we don’t need to be Marlovian to admit this).Edward Alleyn was also approched with his act of “treason” to the spymaster and the Earl of Oxford. He was the “up-start crow”. I’ve found the name of a certain Calvin Hoffman from the USA, who back in the 1950’s years already compared Marlowe’s and Shakespeare’s texts, and claimed that these were written by the same hand. Do you know this man’s works? You seem to be a beginner, why do you inform yourself about Marlowe at a fine impressive personality being a convinced arch-oxfordian…. Who are you? Is your book available in English? Total, complete beginner. Thus, I like to learn from professionals, like you. Please teach me. 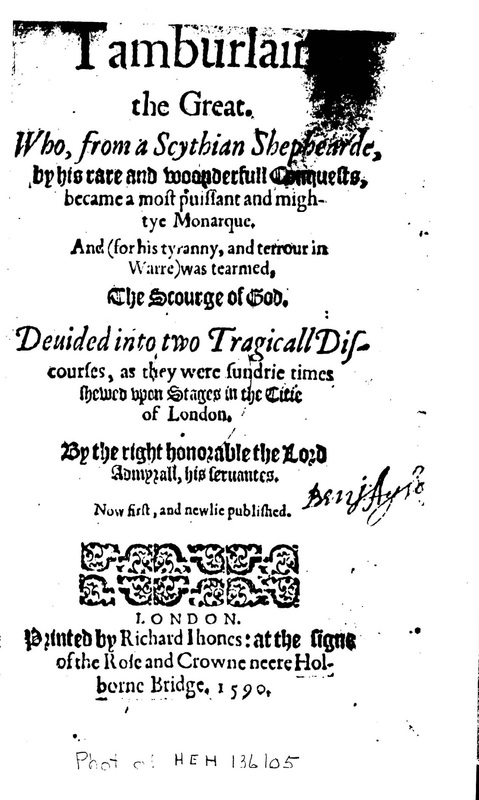 Yes, it’s “The Murder of the Man Who Was ‘Shakespeare'” — proposing that Marlowe did not die but instead slipped away to the continent, where he continued to write under the Shakespeare name. I recommend Daryl Pinksen’s book “Marlowe’s Ghost” (2008) for anyone wanting to pursue that inquiry. “The murder of the man who was Shakespeare”… I’ve read about it sometime ago. Yet, I thought this book was nothing serious of the area, just fiction, like DaVinci’s Code. I know people making a comfortable living from this guesswork. Meanwhile, ridiculung those knowing and proving the truth. How surprised she will be. Unfortunately, my book “The true Shakespeare: Christopher Marlowe (Second Edition, december 2013) is published only in German. I could not find a publisher in England / USA, interested in an English translation. To interest the English-speaking countries at least for the theses of the book, I created an English part of my website (a] homepage / b]blog, c] QUIZ Questions) that makes you familiar with the ideas of the book as well as with a small selection of questions (s.Quiz) which can only be answered , when accepting Marlowe. Concerning the overwhelming amounts of direct and indirect arguments for Marlowe, the book had to be restricted to 700 pages. Thanks. I’ll try to give it some publicity. You have obviously done a lot of work!